Good Morning, My Lovelies! Welcome to My Happy List!!! Please grab my button coding for your post, link-up, and read everyone's Happy List posts! I have a short little list this week as I've been busy preparing for Christmas! 1. Do you know what week it is? It's #ChristmasCookies Week!!! Fresh baked cookies ready for Christmas make me so happy! Most of the cookies I'm sharing this week are freezer-friendly recipes. I enjoyed spending time with my college baby baking cookies for us to enjoy during Christmas. Spending time with my girls make me so happy! Our Christmas aprons got a workout last week! 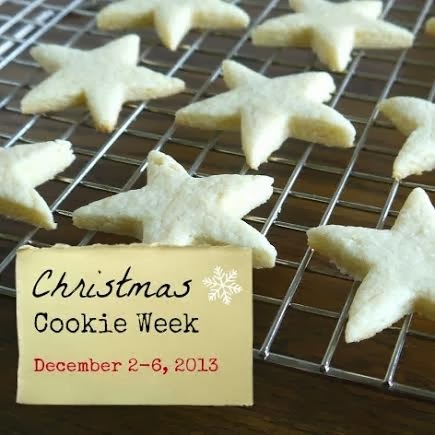 I hope you'll read my posts this week and visit the other ladies participating in Christmas Cookie Week! 2. I made my first ever advent wreath. Instead of having Sunday School, we made wreaths! The advent wreath has three blue candles and one pink candle. Some folks replace the blue ones with purple ones. 3. I really have a good handle on my Christmas shopping. I have a few things I ordered on Cyber Monday that are still out, but otherwise my shopping is done! YAY!!! 4. Mom hosted Thanksgiving, and I wanted to share her Thanksgiving and Christmas decor with you. My mom's style is very formal, but she still likes fun, silly things, too, like The Chipmunks! My mom's Thanksgiving table. The turkey cookies at each place setting served as place cards. I love her ceramic pumpkin collection. 5. I'm very happy with our simple Christmas decor this year. Nothing really new…and we went with pale poinsettias this year. Christmas bowls clutter the kitchen countertops. What's making you happy this week? Please share! Love love those vintage ornaments!! Beauties. I think the best part of baking is when you get to bake with your family. REally special. The ornaments are so pretty. I have an obsession with unique bowls. Very nice!!! Your mom's table was cute with the whimsical decor, and welcoming to young people. So much happiness going on at your house! I will be happy at the end of today when the house is decorated. And, I will be happy the entire time I am decorating and listening to my favorite Christmas tunes. Yay for decorating for the holidays. I'm hoping to get mine done this weekend. Yay! Christmas Cookie week is well-timed, as I need a cutout cookie recipe for a few parties I'm attending, and I don't want just plain old sugar cookies. I love your Mom's table too! How nice you could spend Thanksgiving with her and to bake cookies with your girlies. LOVE shiny brites, RJ and they look lovely in your bowl/muffin pan. Pale poinsettias are a good choice! Great happy list! I love your pretty towels and that cute Simon....oh and your shiny brites! Enjoy your evening my friend! I am so visiting the cookie week. I love it. Your Mom's table is very nice. I love her turkey pumpkin. It is so adorable. Your decorations are great. I am so happy you had a great time with the girls. Have a happy holiday with your girls. Your Moms table looks wonderful and I love those red aprons. Now I have to say that Simon has to come to my house, he looks sooo cute. 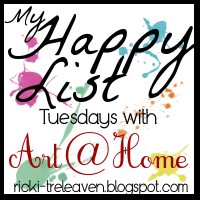 I need to do a happy list! Love these! I'm obviously late arriving, but a visit to Art @ Home always makes me happy!